According the International Anti-Counterfeiting Coalition (IACC), counterfeit products are prevalent across most industries, causing damages of over US $600 billion annually. These counterfeit consumables are typically of inferior build quality, do not adhere to safety standards, diminish the overall customer experience, and can lead to damage to the host devices and OEM liability. 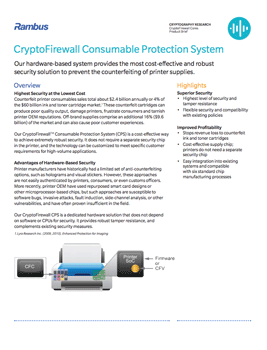 The Rambus CryptoFirewall Consumable Protection System (CPS) is a cost-effective way to achieve extremely robust security. It does not require a separate security chip in the host device, and the technology can be customized to meet specific customer requirements for high-volume applications.